Previously on “24”, we learned: When Marcos gets mad, he really hits the ceiling; Dana is getting phone calls from Milton Waddams and he’s renamed himself “Pardy”; Stabbed, electrocuted, and even blown up – you just can’t stop Jack… He does have Marcos on his shoulder though. 3:00 am – Hastings calls a meeting to describe the plot that we’ve already heard about several times. He gets Chloe and Dana to help him explain this to everyone. They do this just in case someone wasn’t paying attention. Arlo asks Chloe who’s in charge of him – Chloe or Dana? He wants to know who he can make rude remarks to. Chloe tells him to do as he’s told, and she won’t taser him. 3:01 am – Kayla is freaking out now that she’s been informed that Tarin isn’t quite who she thought he was, and she tries to create a Bat Signal through the bathroom window. Meanwhile, Tarin gets a call from Samir, who informs him that there’s Marcos paint all over the inside of the decompression chamber at the hospital and that Marcos might have said something besides “Uh oh” before the paint job. Samir suggests that Tarin take Kayla with him to their secret rendezvous phase, which dares to be even more exciting than the last couple of phases. 3:02 am – Chloe uploads info about Tarin to Jack. Jack is in the car with Cole and is coordinating things with CTU. Dana is coordinating with someone named Sargent Amos. This must be Amos’ first time at a staging area, because all kinds of flashing lights are all around the area. Good thing Tarin hasn’t looked out the window. Amos is informed that Tarin is in room 514 and has Kayla. Jack and Cole then explain the plot so far to him. Jack informs Amos that Tarin is Hasan’s former head of security, and “knows what he’s doing”. Amos respectfully points out that Tarin must really not understand what he’s doing if he’s attempting to kidnap Kayla. 3:04 am – Tarin is getting really impatient with Kayla who tells him she’s “getting ready” It appears he has no previous experience with “getting ready”, and doesn’t realize he could be there for the next 36 hours. He paces around and then looks out the window to see, at that exact moment, two strange things – 1) No cars on the streets below and 2) Men with guns headed to the building. The weird part of that is, they’re actually the police, and not just random New Yorkers. Tarin grabs Kayla and heads to the elevators in the completely empty hotel. Despite his insistence that Amos wait until he gets there, Jack is ignored! Sergeant Amos has no idea the world of hurt that Jack can put him in, so he creeps through the building with 3 of his stealthiest friends. They are, however, not stealthy enough. Tarin easily shoots them all and they all go down. Apparently all of them forgot to wear their bulletproof vests! Tarin grabs a walkie-talkie and does an impression of one of the downed agents. Kayla takes this prime opportunity NOT to yell and scream for help, thereby helping Tarin redirect the rest of CTU to the wrong end of the building. Well, everyone except for Jack. It takes Jack about 2 seconds to realize what Tarin is up to, and they’re back on Tarin’s trail. 3:08 am – Tarin and Kayla make it to the alley, where they’re confronted by two officers. A taxi pulls up behind them. The driver, not familiar with the customs of the United States taxi cab system, shoots both of the officers (who also weren’t wearing vests today), in an effort to secure Tarin’s and Kayla’s taxi fares. Jack asks that all officers look for a yellow cab in New York. They immediately find a dramatic tunnel to drive in, and find the taxi. Jack pulls a gun on the taxi, and it surrenders. Everyone inside is gone. They head back to CTU. 3:11 am – Samir calls his lead terrorist engineer who, like many engineers, is still working on his nuclear bomb hardware project up until the very last minute. 3:16 am – Chloe informs Hastings that they’re still looking around for terror, anywhere they can find it. 3:17 am – A guard informs Dana that a “Prady” is here to see her. Dana asks Chloe to “cover” for her. Chloe gives her a look as if to say, “Hey, you already walked off the job at least twice today. Haven’t you learned anything?” Chloe is the master of transmitting complex messages in facial expressions. Dana takes a long walk to see Prady. He gives her a Hollywood head shot of Kevin, who won’t be answering those agent calls anytime soon. Dana “admits” to meeting Kevin in a bar, but can’t come up with a decent bar joke, since she’s pretty nervous. She explains that she and Kevin really got to know each other much more than she intended, and that she doesn’t want Cole to find out about it. She tells him she has no idea where he is. Prady tells her that he knows about the break-in at the warehouse and he’s pretty sure that Kevin and Nick were after a case of red staplers. Dana tells him that she doesn’t know anything about that. She says she really has to get back to work on a national security crisis. Prady says he’ll just wait until she’s got more time to talk. 3:20 am – Dahlia is pretty upset that “the Americans” lost Kayla. Hasan points out that their own people took Kayla. Jack arrives, and they rehash the plot some more while Dahlia complains about Americans some more. At this point, the best thing they can do is set up some monitoring devices. 3:21 am – At an undisclosed location, Kayla is wearing a blindfold. It looks like Tarin wants to take her to play a game of Pin the Tail on Infidel, but she doesn’t want to play. He sits her down in a chair, where she meets Samir, who wants to video tape her for an upcoming terrorist recruitment video that they’ve been planning for weeks. 3:27 am – Dahlia receives a phone call. The voice says, “Your husband is a traitor to the people of the Republic. Oh….wait… is this Dahlia? Sorry, I thought I might have the wrong number”. She hands the phone to Omar. Samir tells him that he wants “File 33”, which of course nobody except Omar and Samir have heard of. Dana goes scrambling to see if she can find out anything about Files 1 through 32. Samir tells Omar that he’s got an IP address that he wants to give to CTU. They broadcast the video which is crystal clear, and definitely NOT branded as CISCO technology, because they really don’t want that kind of product placement. Samir is now wearing a Terrorist ski mask, which is kind of ironic, since there’s no snow in Samir’s fictional country. He takes a clear plastic bag, which is also NOT branded in any way, and tries to Ziploc seal Kayla. He tells Hasan to get him File 33, or Kayla will die. The internet video cuts out with no warning, leaving no signal, which is one of the first realistic things that has happened on the show so far. Jack wants to know what File 33 is. Hastings takes this opportunity to call Jack to join in on the questions about File 33. Hasan is reluctant to show them at first, but finally relents and tells one of his assistants to show them. From the way Hasan was acting, it appeared that File 33 was a book manuscript he’d been working on for the last couple of years, but it turns out that File 33 is something else. Hasan types in his password, and it is, as so many passwords on television are, all stars. File 33 is a complete description of all US anti-nuclear defenses and the radiological detection arrays. Hastings wants to know where Hasan got it. He says, “I Googled for it.” Jack points out the obvious, that with all the information, Samir will have no problem getting around any defenses. He also points out that if Omar gives over this info, a lot of people are going to die. Not the people that have had a lot of plastic surgery, since they’ll probably live a couple extra decades regardless of what happens, but a lot of other people are going to die. While this was going on, Arlo was analyzing the video to see if there were any weird noises he could enjoy later, and he accidentally heard a subway noise. Using that noise they were able to cross reference where all the subway trains were at that exact moment and then isolated where Kayla probably is, down to a six block radius. Jack decides to go after her, but needs Omar to transfer a corrupted ZIP file to stall Samir while they’re on their way. 3:33 am – Tarin has taken Kayla to another room, pulls off her gag, and tells her not to say anything. He goes out to argue with Samir about what to do with Kayla. Tarin wants to take her out on a date, but Samir thinks it would be better if he killed her instead. 3:40 am – Chloe continues to lead Arlo and Dana in figuring out the exact building that Kayla is in, when Arlo notices that someone let Pardy loose. Arlo asks who Pardy is, and Dana says “Nobody”. Arlo jumps up and screams, “Nobody? Then I’m seeing ghosts!” and runs out of the room. Chloe drags him back in to continue doing work while Dana goes to see how Pardy slipped past all the CTU guards so he could wander around. 3:42 am – Pardy tells Dana that he just found out the security cameras were disabled the whole time that Kevin and Nick were in the warehouse. He also points out that the only technology Kevin and Nick are capable of is “large rock”. He thinks that “someone” might have helped them and since Dana works at a place that takes video of every single video camera in New York and archives it, she might have access to that information. Pardy is pretty good at putting two and two together, and if Hastings were around he’d probably be worried about his job security right about now. Pardy thinks that “metadata” can help find out and that putting all the data on a “100 gig” thumb drive would be all that he needs. Video would probably be better than just metadata. With all this technical talk, Dana looks concerned that Pardy might know more about technology than she does. Dana calls Cole about what Pardy is asking for and tells him that she’s going to give him everything he wants, but will have a good cry about it first. 3:45 am – Dahlia and Omar talk about the file, Kayla, and Omar’s impressive Toast Master’s capabilities. It’s time for Kayla’s video again, and it’s not going to be something romantic like “The Notebook”. Tarin comes over to take Kayla to the video feed, and she pleads for her life. It works! They make a run for it. They decide they need to make a run for CTU. They are so important that ONE guy goes after them, who Tarin knocks flat. They grab his car keys and run to the car. Tarin makes a classic mistakes and gets out of the car, only to be shot by Samir. And dies. Kayla drives away as Samir tries to shoot her too. 3:51 am – Omar and Dahlia watch video, only watching the empty chair and flag. CTU has no idea what the heck is going on, which is normal. Dana gets a phone call from Kayla and she explains that she escaped. Jack asks where she was being held. She narrows it down to “dark and abandoned”, which describes most of the Grunge Bands from the 1990s. Then she mentions a bank vault, of which there are only 265,000 in New York, but it gives Chloe enough to go on. Chloe finds it in 3 seconds. 3:53 am – Jack, who was just 4 seconds away from where Samir has been hiding, shoots a glass door that wouldn’t listen to him. He and Cole enter the building. They look around, but don’t find anything, at least at first. They find a basement area and continue to search after consulting with Chloe. Arlo spots the terrorists going out the south exit on a video feed that he was using to monitor women in the area. Hastings finally gives Dana a complement after she informs her that she did a good thing by helping Kayla. Chloe does a quick analysis of the video that Arlo found, and sees that Tarin is alive! The whole thing was staged in the shortest plot twist ever to hit 24. They wanted Kayla to escape. Chloe informs Jack of what’s happening, and he realizes what Samir and Tarin are up to. They wanted her to head to CTU so they could blow the whole place up! Everyone realizes this and mass panic hits CTU. Kayla drives the car right up to the front door. The guards decide that instead of getting the car the heck out of there RIGHT NOW, it would be a lot more fun to look for it. They find it, and it’s easily identifiable by the tell-tale countdown timer, which all bombs are required to have. Ah, but this is no ordinary bomb. This is an EMP, which is set up to exploded and wipe out all electronic equipment. This bomb explodes, screwing up every single system at CTU, and much to Dana’s relief, all the video equipment too. Jack loses contact with Chloe and CTU. The terrorists have two problems now: Jack and Chloe, who’s going to be extra mad that someone messed with her computers. Jack tells Cole to contact the NSA. 4:00 am – TIME’S UP! 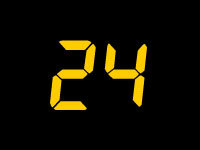 NEXT TIME ON “24” – Shooting! Finally! I noticed in Monday’s episode that the NYPD were going to set up a cordon to surround the terrorists. Is that similar to CTU’s perimeters, or does CTU have a copyright on the use of the word perimeter? Also, does a cordon actually work, unlike the perimeters?